Hi Folks, It's the most anticipated "Best of Year" wine list in Australia and it was released last Saturday. This year there were over 1,000 wines submitted for the James Halliday Top 100 selection and of course, 100 were selected. As we do, Cloudwine has picked the eyes out of the list, selected 6 different wines and bundled them into a Red 6-pack for $110. You'll be pleased to know you can buy some of the wines individually as well. Some wines are so limited, they're not available for individual sale, just in the 6pack. 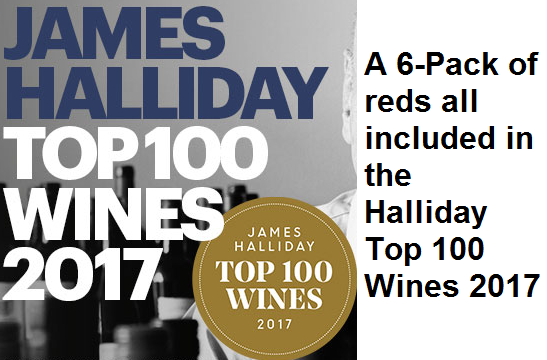 Now here's a question: Is there any need to offer extra wines when we've got the James Halliday Top 100 Reds 6-Pack for $110 leading? Probably not, however you are reading the Cloudwine newsletter so we've done just that. We have one of New Zealand's most awarded Pinot Noirs - Lowburn Ferry Home Block Pinot Noir 2015 which was awarded Trophy Champion Pinot Noir at the Sydney International Wine Show. We also have Lightfoot and Sons Home Block Gippsland Chardonnay 2015 which received 97 Points and was also included in the Top 100 Wines of the Year 2017 by James Halliday. For this wine and others, scroll down below. Thanks for supporting a small independent wine store! Chris, Geoffrey, Jeremy, Simon & Laura. Lowburn Ferry Home Block Pinot Noir is a classic Central Otago pinot noir. It has an aromatic nose and lifted perfume of spice and cherry. Rich and concentrated palate with ripe red and dark fruits, hints of chocolate and subtle integrated oak, with a long finish. "Pressed straight to French oak (30% new) for fermentation on full solids, matured for 10 months. The depth, intensity and length of the fruits are exceptional; throws down the gauntlet at the feet of top class Yarra chardonnays. The grapefruit component is mouthwatering, drawing saliva from the mouth, crunchy acidity an ally. Drink by: 2030; Rating: 97 Points & Special Value Star; Top 100 Wines of the Year 2017" James Halliday. Deep crimson; continuing a line of distinguished wines at bargain basement prices, it is elegant, full of life, and brings together a stream of juicy black cherry fruit, balanced and integrated tannins, and some cleverly handled oak inputs. It is particularly exceptional value. Drink by: 2035; Price: $24.00; Date Tasted: Sept 2017; Alcohol: 14%; Rating: 96 Points & Special Value Star; Top 100 Wines of the Year 2017; James Halliday.